The science of neuroplasticity, also known as brain plasticity, is the basis of Posit Science's BrainHQ exercises. Your brain’s natural ability to adapt itself throughout your lifetime is called brain plasticity. Your brain is constantly in a state of change–sometimes for the worse, sometimes for the better. The exercises within BrainHQ are designed to harness your changing brain and direct it so that you can improve brain function and the quality of your life while enhancing your overall performance. However, this is no simple task since our brains are the most complex machines in the world. More than 100 world experts in the science of neuroplasticity have been involved in designing the Posit Science exercises. Our team benefits from the unique scientific expertise that each individual provides. Nearly all of the behavioural faculties that can be improved using your neuroplasticity have been addressed in our brain-improving programs thanks to their contributions. Our brain is constantly receiving information from our ears, our eyes, and other sensory organs. Our brains then construct our memories and experiences using this information - from mundane things like a drive to the grocery store or a co-worker’s name to more magnificent things like a once-in-a-lifetime vacation, a wedding proposal, or a loved one’s face. We are better able to respond to information, store it, and recall it later when our brain is able to clearly register and record the information. All of the small details of what you hear and what you see need to be managed effectively by your brain. Errors and confusion can result if your brain misses any of that important information. This can be severely limiting – and a challenge that you may not even realize you are experiencing. Missing a lot of detail will naturally force your brain to slow down quite a bit so that it has a better chance at avoiding mistakes. Ultimately, all of your brain’s higher operations in acting and thinking will suffer if it is imprecise and fuzzy in its most elemental operations. You can practice thinking and acting forever, but if your brain must always rely on incomplete and fuzzy information it simply won’t improve very much. A key step in enhancing your brain’s overall function is improving its sharp representation of the details you hear, see and feel. Through this, you can easily improve brain function. 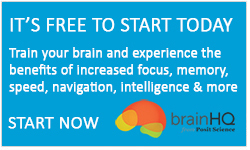 To address this fundamental need in your brain development, the BrainHQ exercises by Posit Science have been designed to increase the quantity of sensory information that the brain is able to register and to improve the quality of the brain’s ability to process and record information. All of the “higher” functions of the brain that work with this sensory information will be improved through a ripple effect. Strengthening a tree’s trunk, creating shinier leaves, and producing more fruits can all be achieved when roots are healthy and able to absorb an abundance of nutrients and water. 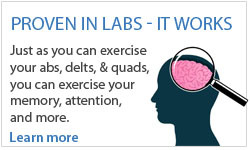 Our BrainHQ exercises are, in essence, strengthening your brain from the roots up. This approach is very different from other brain games and exercises that instead teach brain tricks, provide strategies for compensating, or simply drill your brain to improve memory. 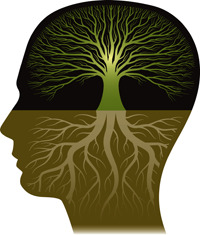 It has been demonstrated through many scientific studies that ignoring the roots while focusing attention on the fruit offers only limited and short-term benefits. As we grow older our brain slowly turns down its “dimmer switch”. Getting sharp in the morning can take longer. We may find ourselves experiencing periods of drowsiness or inattention that prevent us from making the most of our days. Even sleep, or rest, don’t seem to restore us to our regular levels of liveliness the way it used to. 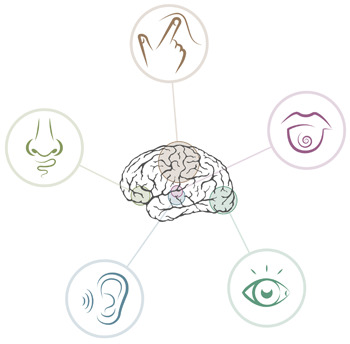 The speed of information being received by our senses (like the sights and sounds happening in our lives around us) does not slow down – but our brains gradually do! It can become much more difficult to remember and react to the things that we see or hear as the brain, over time, begins to miss details. The brain’s pathways often get fuzzier or even distorted – much like the grooves of an old record. If there is a lot of noise on your “sound track” or if the images you see are blurred or indistinct then you can’t expect your brain to be able to make decent recordings of what is happening. In order to correctly understand and interpret the things we are hearing and seeing we need to combine information in special ways. As people grow older it becomes a common problem that they may lose the ability to recognize an old friend or perhaps misinterpret their facial expression. It is extremely important that we maintain our keen ability to both recognize and interpret the things we are hearing and seeing. Cancelling out all the disruptive noise from the world around us or from a worried and distracted brain is something that our brains were extremely good at in our youth. As we age, however, all of this interference gets in the way due, in part, to our diminishing ability to concentrate effectively. This interference becomes a real source of anxiety, frustration, and error as we grow older. In order to determine what information is important for us to process and record our brains use chemicals called neuromodulators. As we grow older our brains produce fewer and fewer neuromodulators. The brain’s ability to record new information becomes hindered by the deficit of neuromodulators which, in effect, hinders our ability to learn and remember. In order to continue flourishing and growing, you need memory-control and learning machinery that is functioning at its highest level. We generally don’t notice when these 6 core trends first begin to cause problems because we often fill in what we miss by applying ‘context’. In essence, we ‘fill in the blanks’ by drawing from our vast life experience in order to make sense of incomplete information. Initially this compensatory behaviour helps us but it ultimately does not improve the quality of the recording (in other words our memory). Over the years as gaps become too large for context to fill in the blanks, it can be extremely difficult to identify and respond to information – both in the moment and in the future. Eliminating the noises that disrupt your memory, attention, and sensory accuracy. Enhancing how well you learn and how much you remember by recovering the power of the controlling brain machinery. “Generalization” is emphasized by the BrainHQ roots-up approach by extending the benefits of the program beyond the task that is being trained. For example, a program designed to help you remember a grocery list might, in fact, help you achieve that specific goal. By exercising the roots of memory through BrainHQ – without ever needing to specifically practice the act of memorizing a grocery list – you will likely improve your ability to remember grocery lists better, along with your ability to remember tasks at work, a movie you saw on the weekend, conversations with a neighbor, where you left your keys, and that word that is on the tip of your tongue! Your overall quality of life is improved by these “generalized” changes. Many of our BrainHQ exercises have been subjected to thorough clinical testing so you don’t have to just take our word for the effectiveness of our brain training approach. 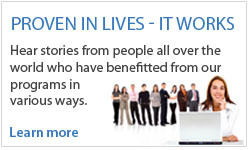 In fact, the results of these clinical studies have been published in leading peer-reviewed journals. If you’d like to view a summary of the clinical testing you can click here.